Is THE systems approach a supersystem approach? This is a summary of the last, concluding Chapter Fourteen of The Systems Approach (TSA). It is part of a series of blogging posts, which covered the whole of Churchman’s The Systems Approach (TSA), a rather well-known book he wrote in 1968, of which I am convinced that it hasn’t lost any of its relevance to the decision-making problems of the world today. You are advised to first read my summaries of the preface and chapters 1 through 13 since I will avoid repetition as much as possible. As usual, the paragraph numbers refer to the numbers in the concept map. 1. The critical problem According to Churchman, “the most critical problem we face today [is] the understanding of the systems in which we live.” (TSA 230). Decision-makers in all areas of society fail to take the right decisions, because the expert planners advising them rely mostly on non-systemic or not properly systemic intervention models. In the preface of The Systems Approach, Churchman makes a distinction between the “systems approach” of the management scientist and the systems approach of the system philosopher. Of the systems approach he says that it “consists of a continuing debate between various attitudes of mind [perspectives] with respect to society,” including those of the humanist and the anti-planner (see previous post↗). It is for this reason that the systems approach can also be called the dialectical systems approach. It is the last resort in man’s attempt to deal with the critical problem, which is that people – experts, decision-makers, planners, scientists, politicians, reporters and citizens alike – fail to understand the systems they live in. 2. The scientific “systems approach” …., or the application of science to systems design, is “the main topic of conversation of the entire book” (TSA 229) and subject to severe crticism. Churchman goes as far as stating that the scientist can be conceived as an anti-planner↗ and a deceived scientist, who believes “that science has arrived at a plateau [of perfect inquiry] where its own change is minimized.” The ultimate meaning of the systems approach, in his view, “lies in the creation of a theory of deception and in a fuller understanding of the ways in which the human being can be deceived about his world and in an interaction between these different viewpoints” or perspectives. In other words: to perceive more clearly, we must use different perspectives to understand better how singular perspectives are deceptive. 3. The dialectical systems approach … is promoted by the system philosopher. He does so by contrasting and critiquing the different systems approaches. He uses – at least in this book – the scientific systems approach as a starting point. It is the management scientist who notes that the efficiency expert is deceived by his perception of idleness and slack in the system. But similarly the management scientist is deceived by his approach, “in which ´all´ of the objectives are represented and a ´proper´ compromise is created.” (TSA 228). “In the straight-faced seriousness of his approach, he forgets many things: basic human values and his own inability really to understand all aspects of the system, and especially its politics.” But then Churchman – the archetypal dialectical system approacher – admits: “I, too, am biased and deceived.” (TSA 230). 4. All approaches limited The systems approach is an unattainable ideal. 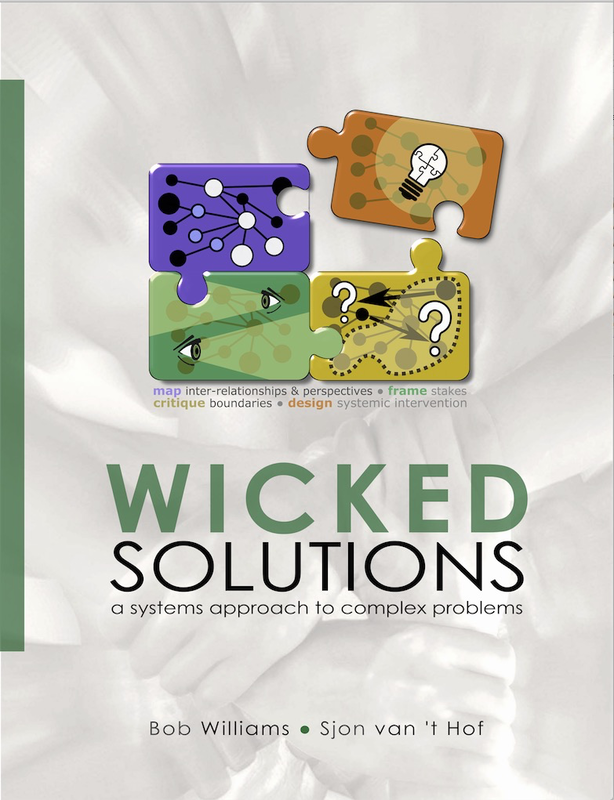 “Each person looks at [complex problems] in such a one-sided way that the systems approach is lost. […] People are not apt to wish to explore problems in depth with their antagonists. Above all, they are not apt to take on the burden of really believing that their antagonist may be right.” So: (1) we must recognize that understanding our complex problematic systems (or situations) is our most critical problem; (2) we must admit that this problem, i.e. finding the appropriate approach to systems, is not solved and will never be solved; because (3) continuous perception and deception are in the nature of [complex, human] systems; so (4) we must resign ourselves to a continuing re-viewing of the world, of the whole system, and of its parts (or components). (TSA 230). 5. Confusion and enlightenment … are “inseparable aspects of human living” (TSA 231). The notion of separability or non-separability is very important in Churchman’s approach. It is the belief in separability that enable us to develop clear ideas. A good example is that of the efficiency expert, who looks at slack in the system as a separate phenomenon, which he can remove without affecting the rest of the system. He feels enlightened. Then comes the management scientists, who confuses him with ideas about non-separability of different aspects of the system. The management scientist is not opposed to efficiency, but it must be embedded↗ in the rest of the system. Finally comes Churchman, who ‘confuses’ (and ‘enlightens’!!) the management scientist and everybody else with his principles of deception-perception. 6. Principles of deception-perception: (a) “The systems approach begins when first you see the world through the eyes of another.” The reason for this is that it enables us to realize that alternative world views have validity, while being in conflict with our own world views. It shows us the role of models in our perception and the fundamental need for dialectics. (b) “The systems approach goes on discovering that every world view is terribly restricted.” The reason is that world views tend to look at parts as if they are wholes, or wholes as if they are parts. The embedding principle↗ works both ways, endlessly expanding and contracting. (c) “There are no experts in the systems approach.” The public always knows more than any expert. Everybody who lives in the system has a valid perspective, which some experts find hard to admit. (d) “The systems approach is not a bad idea.” This is not so, because there is no alternative (i.e. to deception), not because it is perfect (i.e. with perception only). See paragraph 4 above. 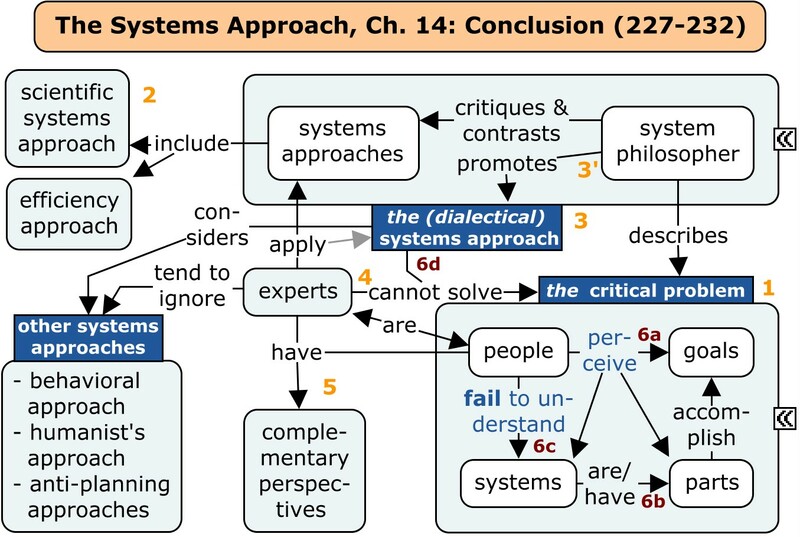 Final note “The Systems Approach” is not Churchman’s last book about the dialectical systems approach. On p. 43 of “The Design of Inquiring Systems” (1971↗) Churchman describes how the anatomy of goal seeking by whole systems can be used for developing a framework of categories (or considerations or categorical considerations) in a system of inquiry. On p. 79-100 of “The Systems Approach and Its Enemies” (1979↗) he develops this framework a bit further. One of his students, Werner Ulrich, adapted this framework to suit his “Critical Heuristics of Social Planning” (1983↗). In this latter form it has found its way, via a large community of practice in the UK (Open University, University of Hull), into “Wicked Solutions” (2016↗, see also below). During the writing of Wicked Solutions it became apparent how closely it follows the original ideas of Churchman. As an avid concept mapper I produced a combination of Churchman’s and Ulrich’s framework (2nd version) to clarify these relationships (see also my post on goal seeking systems). 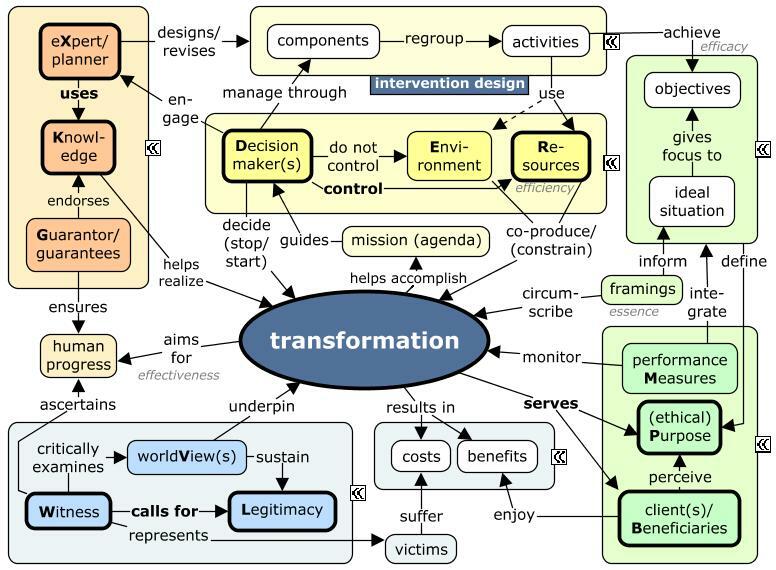 The framework didn’t exist at the time of writing “The Systems Approach” (1968) except perhaps as a mental ‘map’ in Churchman’s mind, but it is easy to recognize the framework’s elements in “The Systems Approach”. In fact, it would be useful for the reader of “The Systems Approach” to have this framework in mind, which is why I add it to this post. But beware, the below framework contains ideas of Ulrich (1983) and Williams & Van ‘t Hof (2016). Expect me to produce a more purely Churchmannian one somewhere in 2017 or 2018. This is the best I have, so far.